Students create and use spinners to practice making pictographs. Fun activity for learning about pictographs, practicing making pictographs, or to review pictographs. 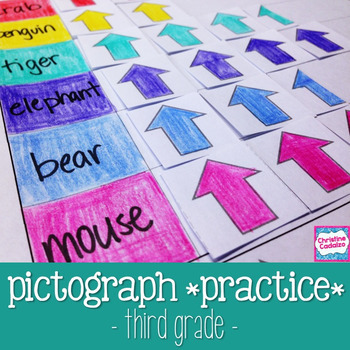 Could also be used as a pictograph math center activity. Students design and conduct surveys, then create pictographs and present their findings. This is a fun activity for learning about pictographs, practicing making pictographs, or to review pictographs. It would work perfectly as a culminating activity or even assessment for understanding pictographs. -two pages of presentation outline page to help students interpret their data and prepare to present their pictographs. -printable markers/ pictograph icons: happy faces, stars, hands, and hearts. -blank pictograph icon page for students to create their own.